You, Me and Movies: Review: Everything about "Valerian" is long and motionless. Review: Everything about "Valerian" is long and motionless. In 1997, there was a science fiction film that I fell in love with called "The Fifth Element." I was blown away by the look of the future, the fun adventure in the film, and just how bloody interesting it was. That film was made by Luc Besson and he created a unique look at the future, something we weren't seeing much of at the time. "The Fifth Element" was not big at the beginning, but it eventually developed a cult following, and now its a big favorite for a significant amount of fans. Luc Besson returns to the future with "Valerian and the City of a Thousand Planets," an adaptation of a French comic book. I wish I can say the same positive things for "Valerian," which I am just going to abbreviate as "Valerian," I have no pleasure to write out the name over and over again in this review. I don't think "Valerian" is going to have the same kick after it vanishes out of theaters soon. I don't think it found an audience when it was released over the weekend and I don't think one will pop up now or anytime later. "Valerian" does not have the same energy as "The Fifth Element" did, it does not have the same sense of adventure. It does not have the same memorable characters or emotional depth. "Valerian" is just kind of there. Yes, its visuals are great, this I will give the film. I can spend possibly two thousand words on how beautiful the various sites, aliens and futuristic hardware is in this movie. I could turn the volume off of this movie and just view it as a silent movie, and I would probably like the movie much better. But "Valerian" isn't a silent movie. It takes place in the future, on board a space station called Alpha. What started out as any old space station quickly became a place where people all over the world could congregate with species from all over the universe. They began sharing their technology, sharing their knowledge and sharing their culture with each other. It became a very peaceful place. 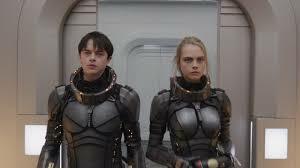 We follow Valerian (Dane DeHaan) and Laureline (Cara Delevingne) who are police men working on the city of a thousand planets, which is what Alpha eventually turned into. They make a good team and as you could have guessed, a romance between them begins to blossom. For being a peaceful place for countless different races from all over the universe, not all is well on the city of a thousand planets, there is a conspiracy which got an entire planet destroyed. There are those trying to cover up that this specific planet was destroyed. Valerian and Laureline plan to find out what that is. The problem is that the mystery of the film is never really intense, interesting or even mysterious. Once the culprit is revealed, its pretty clear that you will be able to find out that they are the villain of the movie. Plus, the evil plot, really isn't interesting either. I have watched Cara Delevingne in a couple films now, and I honestly don't see the appeal. She just comes off as a blank who memorizes scripts, not a full blown actress. I don't get any emotions from her. I don't feel anything from any of the characters she creates. I really don't see her appeal. Because, honestly, she isn't that good looking either, so I don't see how she can even serve as eye candy. How is she still getting work when there are far more talented, far better looking actresses her age out in the world? I don't get it. Dane DeHaan is usually an actor that I like, but I think he's an actor that works well in grounded, dramatic stuff. When he stars in high concept fare like this and "The Amazing Spider-Man 2," he's too hammy, too quirky and I don't believe in the characters he plays. I think certain actors can fit certain styles, and no matter what they can do other styles. I mean, I can never imagine Daniel Day-Lewis doing a superhero or supernatural film, I think DeHaan might suffer the same problem. Yes, Rhianna shows up. She's fine I guess. But nothing special. Its too bad, because its clear lots of creativity and care went into the creation of the visuals. Much like "Ghost In The Shell" earlier this year, "Valerian" is masterful just to stare at. Its pretty easy to get lost in the film's visuals. But no creativity and care went into forming a compelling story to tell, nor making up genuine, unique characters. At nearly two and a half hours, its a pretty long movie for a story that really doesn't do much. "The Fifth Element" is a fairy simple story, but Bruce Willis had a compelling character to play, as did Milla Jovovich and Gary Oldman. There was a sense of fun and adventure and it was also marvelous to look at during that particular time period. "Valerian" accomplishes not even half of that. Its a clear that Besson is a visual artist, but I guess the story's get away from him every once in awhile. Or maybe this comic book wasn't worth adapting.